NDVI is a simple metric which indicates the health of vegetation. 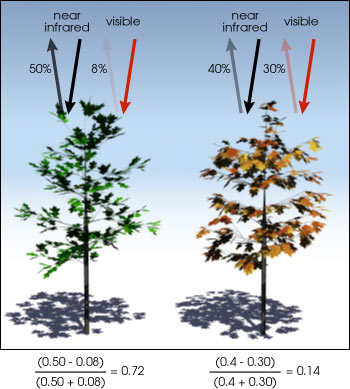 When near infrared hits the leaf of a healthy plant it is reflected back into the atmosphere. As the amount of chlorophyll produced in a plant decreases less near infrared is reflected. This can be used to see the overall health of a crop. The NDVI algorithm compares the reflected intensities of near infrared (NIR) and visible light (see here for a more detailed explanation). Image depicting two plants; left (healthy) and right (unhealthy) with NDVI reflectance VI algorithm. Courtesy of NASA. How Does DroneDeploy Calculate NDVI? Your data is processed through several different formulas to give you different options for different insights. See here for a full explanation. The values are calculated for each pixel of your map, giving them an index in the range -1 to 1. What kind of camera do I need on my drone? Standard cameras capture Red, Green, and Blue light. Modified cameras capture some combination of Near Infrared, Red, Green, and Blue light depending on the model. Difference in wavelength capture between standard and modified cameras. 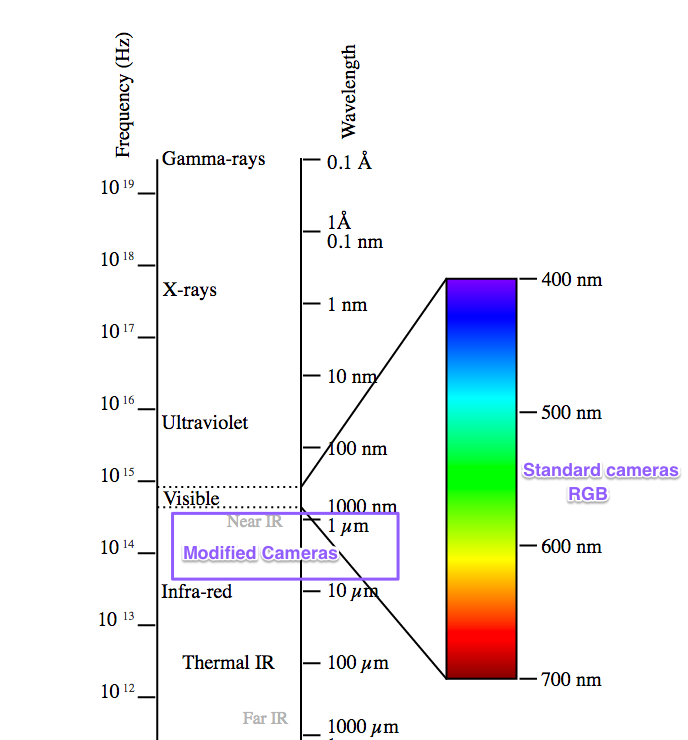 The graph above explains the wavelengths of the electromagnetic spectrum captured by each type of camera. Source: By Victor Blacus (SVG version of File:Electromagnetic-Spectrum.png) CC BY-SA 3.0 via Wikimedia Commons. Use a standard RGB camera with the VARI algorithm. *RGB Plant Health maps are only significant when using the VARI algorithm. The VARI algorithm can be used to see the "greenness" of a crop. Purchase a modified camera that captures Near Infrared Light. We recommend getting quality control samples and a warranty from your hardware vendor prior to purchase. Once you've uploaded your compatible imagery to your DroneDeploy dashboard, it will be automatically processed into an NDVI dataset. When combined with ground-truthing, this data can give you powerful insights into your area of interest. See our explanation of the Plant Health layer for details on what this data means and how to read these maps. We have also interviewed agronomists, farmers, and UAV pilots for a two part blog: "What can NDVI drones do for my business? Misconceptions and advice from agriculture industry experts."